The annual excursion of the Watertown Pfattdeutscher Verein last Sunday was the most successful yet given by the organization. This year it was to Milwaukee, where the opening of the season of National Park took place. At 7:30 a.m. a special train of twelve coaches and one baggage car left here over the St. Paul Road. All the coaches were crowded and nearly 1,000 excursionists participated, 650 6f them being from this city. Upon arriving in Milwaukee, a picnic and various pastimes were on the program, and the day was much enjoyed by all. 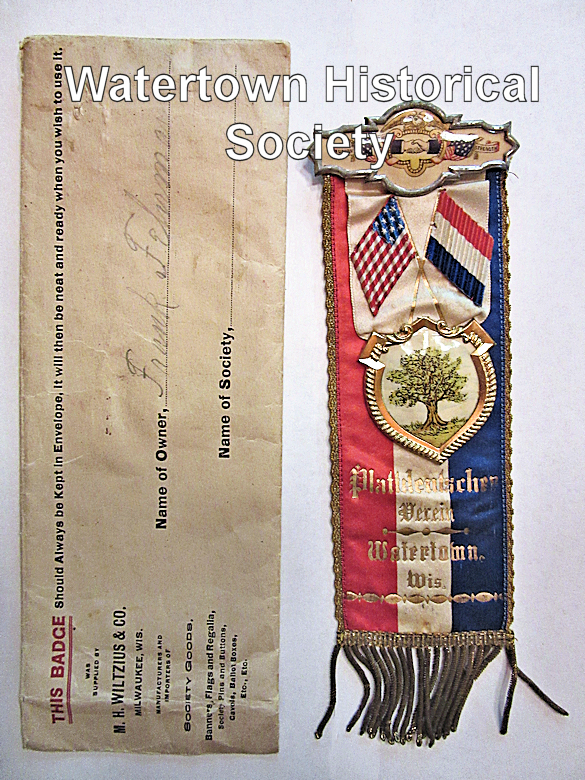 The Plattdeutscher Verein (Low German Club) of Watertown, Wisconsin, was founded in 1882 with a twofold mission: “fraternalism and the perpetuation of the German language, especially the Plattdeutscher tongue.” The regional, cultural, and linguistic diversity of German-speaking immigrants to the U.S. was reflected in the plethora of “Vereine” (clubs, societies, associations) they founded. The German- American “Vereinswesen” (club culture) not only represented an example of direct cultural transfer but also a means through which the transition from the Old Country to the New could be eased. 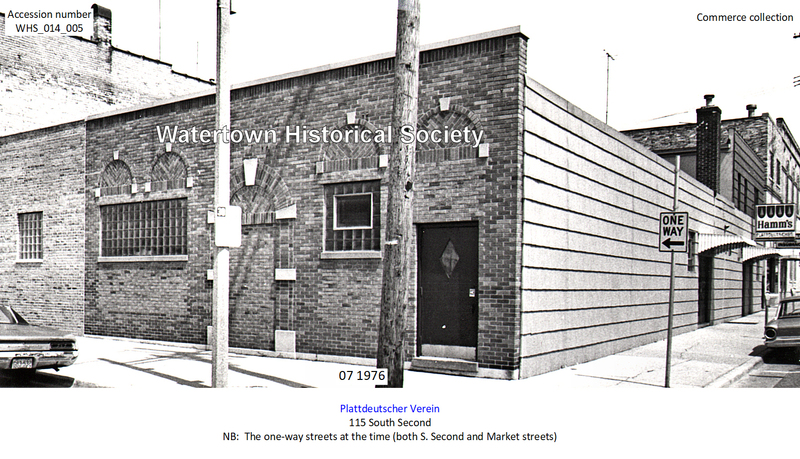 Though many of these clubs did not last beyond the first generation, some still exist today, including Watertown’s Plattdeutscher Verein. Members of Watertown Plattdeutscher Verein and their lady friends, wives and daughters, made merry Saturday evening at a banquet and ball given by the society in honor of the 25th anniversary of the organization of the society. The festivities were held at the Turner and the Weber-Stube orchestra enlivened the occasion with a specially prepared program, while Mrs. William Rohde and Mrs. Charles Zickert attended to the banquet for the society and all enjoyed thoroughly the good things for the inner man placed before them. The ballroom decorations were of especially fine scheme and thoroughly in keeping with the occasion which marks an important epoch in the history of this local association. Every one enjoyed themselves thoroughly from the time the first strains of music broke on the ear until the tones of "Home, Sweet Home" warned the merrymakers that it was time to leave. The organization was effected in May, 1882 with a membership of 27. Its total membership at the present time is 334. Its first officers were: President, John C. Halliger; vice president, Louis W. Krueger; secretary, Otto Linde; treasurer, A. Zickert. Mr. Linde and Mr. Zickert are still alive, the former residing in Milwaukee, and the latter in Fond du Lac. The organization's present officers are: President, Ferdinand A. Krueger; vice president, Carl Stiemke; secretary, J. J. Brusenbach; treasurer, William Riebe; finance committee, Valentine West, Henry Winkler, William Schultz. The organization has a twofold object, that of fraternalism and the perpetuation of the German language, especially the Plattsdeutscher tongue. Its constitution requires that members shall be able to read and speak the German language. Its fraternal feature is confined to a death benefit only, the heirs of the deceased receiving the sum of one dollar from each member. 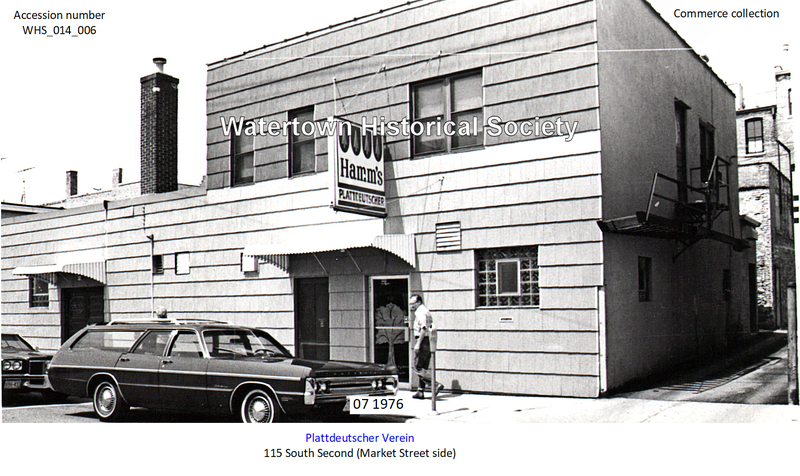 02 14 The Plattdeutscher Verein celebrated at its clubhouse in Watertown, the occasion marking the burning of its mortgage which made possible its remodeling program, which began some five years ago. Lester Teich, vice president of the verein and master of ceremonies, opened the program. Raymond Franz, president of the verein, gave a talk on the acquiring of the club building in 1941, its use and purposes as a home of the verein. Also the realization of the organization on the remodeling program in 1950 was stressed, making it a building representing the verein's home. This was accomplished by hard work, put in by the membership of both the verein and the auxiliary. The Plattdeutscher Verein and the auxiliary of the organization last night held their annual elections of officers and during the evening a 92-year-old member, Franz Koch of 1000 Labaree Street, was presented with a life membership. Mr. Koch's membership in the Plattdeutschers dates back 70 years. He is the oldest member. In addition to the life membership, Mr. Koch was presented with a gift by the organization. Officers elected by the verein are: Marvin O. Niehoff, president; Leonard Fehrman, vice president; Charles Teich, secretary; Wallace Block, treasurer; Max L. Noffz, trustee for three years; Elmer Kube, warden. Other trustees are Raymond F. Franz and Leonard Nass. A Watertown man, 31, a member of the Plattdeutscher Verein, was named in a warrant charging a violation of the state gambling or lottery statutes, following a "raid" at the Plattdeutscher Club building last night. Officers confiscated some bingo-like game equipment and said they found some 25 persons, all said to be members of the Plattdeutscher Verein or its auxiliary, playing the game at tables. Chief of Polite Herbert F. Vehlow went to Jefferson this afternoon to confer with county authorities, including District Attorney Robert J. Shier, relative to steps to be taken on charges. 03 15 The Plattdeutscher Verein and its Auxiliary held its annual meeting Thursday evening at Plattdeutscher Hall. Officers named for the Verein are as follows: Clarence Zabel, president; Leonard Fehrman, vice president; Charles Teich, secretary; Wallace Block, treasurer; Max L. Noffz, trustee, three years; hold-over trustees, Ray Franz and Ernst Oschmann; warden Arthur Lenius. Members of the auxiliary named the following officers; Mrs. Donald Lenius, president; Mrs. Arthur Lenius, vice president; Mrs. August Meyer, secretary; Mrs. Herbert Schoenher, treasurer; Mrs. Max Noffz, trustee, three years; Mrs. Hubert Gronert, Mrs. Wallace Block, hold-over trustees Mrs. Alvin Zabel, warden. 09 29 EXPANSION PLAN: PURCHASE OF TWO BLDGS ON S. SECOND ST. Although the name of the group is German and the first constitution of the group was written in German, membership was, and still is, open to those of many other heritages including Irish, Dutch and Norwegians. Until 1933 the organization was German oriented and all business was conducted in German. “It’s a great way to socialize and get together with your friends,” Frank Wegner, club member, said. The group began as a death benefit association with yearly dues going to the families of members who died in the year. When the club was formed members paid $1 yearly dues. Today, Verein members pay $10 yearly dues and the funds are still divided to families of members who died in the year.